Some of my favorite mini figures to this day are ones I got out of vending machines as a kid. Unfortunately, in recent years vending toy offerings seem to have gotten much less interesting than the used to be. That's why when an awesome vending toy set like "Oh No! Aliens" comes along, you know right away you've got to grab 'em! The Oh No! Aliens set is made up of nine sculpts depicting wacky-looking space creatures. 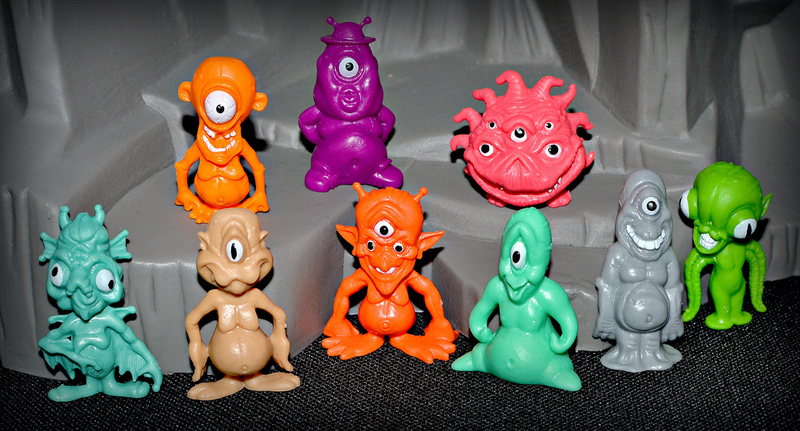 They're made of a hard yet somewhat flexible plastic (think more MUSCLE than Monster in My Pocket) and are monochromatic aside from some painted details on the characters' eyes and mouths. 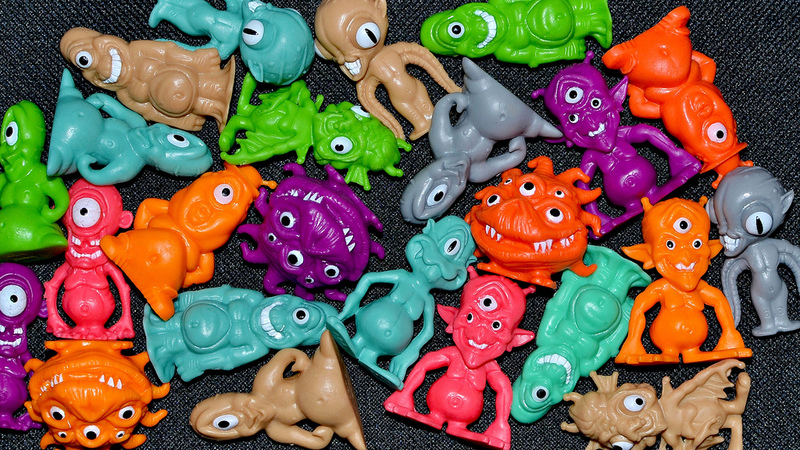 The figures come in nine different colors: neon orange, neon red, pink, purple, beige, aqua, teal, gray, and lime green. 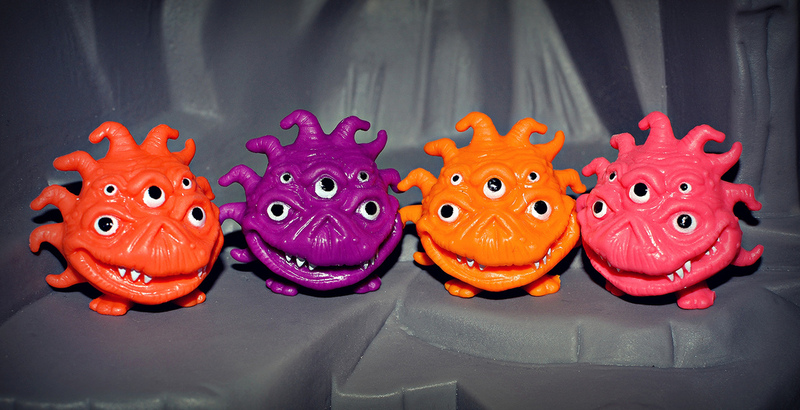 A cool fact I found out about these after getting mine is that they were sculpted by David Arshawsky, whose work is probably part of your toy collection whether you know it or not. David designed/sculpted pieces from classic toy lines such as Playmates' Teenage Mutant Ninja Turtles and Ertl's Socket Poppers. Knowing that, it makes perfect sense that the Oh No! Aliens sculpts are so well done. All of the aliens are really nicely sculpted and detailed, but there are a few that stand out to me. My very favorite has got to be the multi-eyed, ball-shaped creature that's shown in pink in the photo above. It reminds me of a Beholder from Dungeons and Dragons. I also especially love the scrawny, long-faced cyclops alien (shown in neon orange) and the bizarro winged alien (shown in teal). If you can't find these guys in any local vending machines, you can pick them up online. A couple options are Geddes School Supplies and Gumball.com. What do you think of the Oh No! Aliens? Have you got a hold of any yet? These are really cool! I'll try to keep my eye out for vending machines but since I rarely carry change (or see vending machines) I'll probably snag them offline. Krator is too cool not to own. I still haven't seen any in vending machines near me. It's definitely worth picking some up online if you can't find them by you. Unfortunately the distribution in the bag I bought wasn't too even (I got a ton of that one sculpt in the last photo in this post, and other sculpts I only got a few), but I was still able to put together some good sets with the different colors. I have got any yet, but they do look awesoem! Adam, they're definitely some of the best vending toys of recent years. Hopefully you can add some to your collection. I found a vending machine with these little guys at my local Big Lots! I popped in my 3 quarters and out came a lime-green Krator! That's the only one I have, I'll have to go back for more. The quality is outstanding, especially for vending machine fare! You got one of the best ones. :) Yes, they're very high quality for vending toys! Well I finally picked up a few of these, Before I was always passing them by at one of my local grocery stores, now around 3 or more stores have vending machines stocked full of em, It was like I just couldn't escape them! But now I really do love them more and after reading this review more (the bit about David Arshawsky) I love them! It also brings me joy that every time I go to the store I can pop 50c into getting another one! then before you know if you have an army. Very cool. I've actually never seen these in a story. I had to order online.